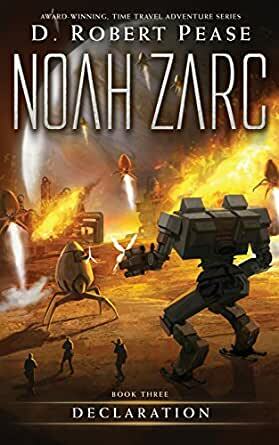 Can Noah Zarc keep peace across the solar system... even if it means starting a war? As battles rage across the solar system, Noah Zarc must work to unite a rag-tag bunch of miners, farmers, and scientists who would rather just live in peace than fight a war which could set humanity back to the dark ages... if not destroy them altogether. With only a time-traveling ship full of animals and a General from the history books (who is more comfortable riding a horse than in a spaceship) the Zarc family has to stand against the full might of a highly trained army of attack-drones, and a fleet of battleships armed with enough firepower to take out an entire planet. Will the truth about what really happened a thousand years in the past be enough to stop total war? Or will Noah and his friends need to find another way to bring down a ruthless dictator who will do anything to keep himself in power... even if it means destroying the very people he rules? AUTHOR: My whole life, I've loved hearing and reading stories, and creating worlds of my own. As a child, I spent countless hours drawing crazy contraptions on paper, or building vast fortresses in a sand pile behind my garage. There was hardly a time I wasn't off on some adventure in my mind, to the dismay of parents and teachers alike. So it's no big surprise I took all that daydreaming, all that longing to really see the wonder of creation around me, and started pouring it into discovering hidden universes in my own mind. For quite a few years I tried my hand at writing, mostly working on one, massive fantasy novel, but it wasn't until I had kids and they became voracious readers that I found my passion. There's no greater audience than a child. I'd rather have a simple review from a kid that says, "Awesome book!" than a five-star review in the New York Times. Of course, if anyone at the Times wants to try to prove me wrong, I'd be willing to let you. 5.0 out of 5 starsMost Fantastic Book to get Young Boys Reading! As an adult I cannot see exactly what is so special about this book - I mean it is well-written, but to me it seems just like any other modern middle grade story. However, my son is absolutely crazy about this series. He told me that the whole story is a cliff-hanger from beginning to end, and that one cannot put the book down at any moment. That is pretty amazing coming from someone who has been rejecting all the books I buy on the basis of being "boring" or "the same old thing." What do I think made the book so special to him? Well, there is the futuristic setting, time travel, simultaneous space and time concepts, robots controlled by neurological chips and other space-age related gadgets and concepts. In fact, the whole time-jumping thing back-and-forth and different selves has me quite confused, but to my son it is perfectly logical. Then there is the character of Noah. What a hero! What an amazing character. Mature, sensitive, brave. Faced by moral and existential issues on a scale that no 12-year old boy would normally have to deal with. Faced with unusual challenges. Faced with the most bizarre conditions in his life. He displays patience and the ability to examine all sides of an issue before jumping to any conclusions. He has to sort out his relationship with his father - find out who he really is, and learn to love him with both his good and bad side. He has to learn to discern truth and trust his instincts, and solve the situation without harming those he loves, for the good of all, for the people, plants and animals of Venus, Mars and Earth. There are some serious issues in the book, such as Noah's real father having committed crimes in his past, but there is no explicit violence or gore. As a parent who does not approve of my children reading excessively violent books, I give my approval to this series. Noah acts with love and respect for his parents at all times, and they love him too. I am just so happy that my son found these books!!! We hope to see more from this author. 5.0 out of 5 starsThe best one yet! Noah and his eclectic family make me want to be adopted by them! I was captivated from the start! The issues our hero deals with certainly are not the same ones that you and I face but that’s why it’s such an engrossing story! I think the characters were all, ultimately, honorable despite a rocky past. For edge of your seat fiction it had some excellent lessons about choosing happiness in all the moments of life rather than waiting on reaching goals in order to be happy, something most of us need to be reminded of. Noah gives a wonderful example of selflessness, of family loyalty, duty and personal responsibility to further the good of humanity. I am impressed with the author's ability to 'hide' all those lessons in a book that kept me up half the night because I couldn’t put it down. Noah, being the main character in the story wanted to be in on all the action throughout the book. He seemed quite a pilot especially for a young person (any young person might dream to be like this also). He placed himself in danger while attempting to right the wrongs of those in charge, "save" those on the various colonies, etc...the end looked like might have another book at some point, but lot of books end that way. This was series was GREAT!!! Read all the books couldn't get enough. Do you really have to bend the series? You did leave an opening to bring it back. Think about it! As an old fashioned mom I don't think 9-12 yr olds(target audience for this book) need to be reading about a kiss on the lips, nor do I think 14 yr olds(age of the characters) should be killing people or kissing on the lips. Also, I thought some of the things that happened were a little unrealistic and both my 11 yr old daughter and I disliked the ending intensely. As an aside, I thought the series would have some kind of reference to God, seeing as it is sorta like Noah's ark. Kept waiting for that to happen but it never did. Found the Dad's comments at the end to be inane.